A freshly designed Replica Guernsey featuring a restructured 3 piece neckline and considered panelling details on the body. The cross stretch insert on the back neck offers an unparalleled fit. With a soft handle and sleek appearance the Axis fabric helps make this the closest thing to what your heroes are wearing on game day. 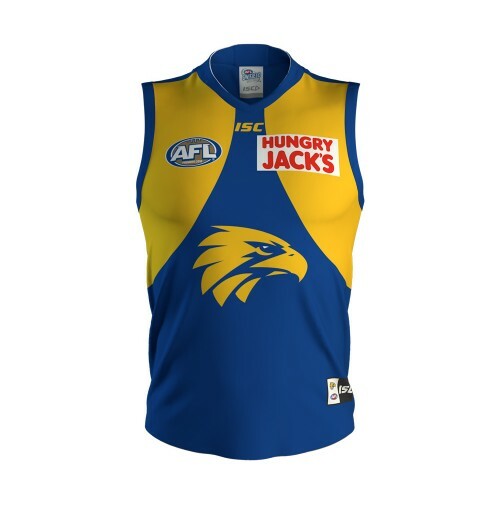 Updated for 2019 with the Gold Premiers 2018 AFL badge. Care Instructions: Gentle machine wash in warm water. Fabric: In 2013 ISC launched Feather. The fabric instantly revolutionised on field performance across our wide spectrum of elite athletes. After extensive research and testing ISC now brings you AXIS.